The Minnesota Public Utilities Commission’s (PUC’s) Sept. 5 final order approving the Enbridge Line 3 crude oil pipeline is disturbing. It ignores significant arguments brought forward by Native nations, environmental groups and youth, cherry picking facts to justify its decision. The order has many flaws in how it addresses climate change, environmental risks to our state’s clean waters, and other issues that will be explored in a later blog. This blog focuses on the order’s racist conclusion that the PUC doesn’t need to consider the pipeline’s treaty rights impacts. Based on the entire record, the Commission concurs in many of the ALJ’s findings and conclusions. On some issues, however, the Commission makes different findings, or weighs the evidence differently … and reaches different conclusions, as explained below. The Commission will therefore adopt the ALJ Report to the extent that it is necessary for and consistent with the Commission’s decision contained in this order. Comment: This language is the epitome of white privilege and white supremacy. First, the PUC dismisses the issue of treaty rights, relegating it to a mere footnote. Second, the PUC provides no justification for its decision to ignore treaty rights; it simply states as fact: “this discussion is not necessary …” Had the PUC tried to justify ignoring treaty rights, the flaws in its argument would have become more apparent, because there is no justification for ignoring treaty rights. 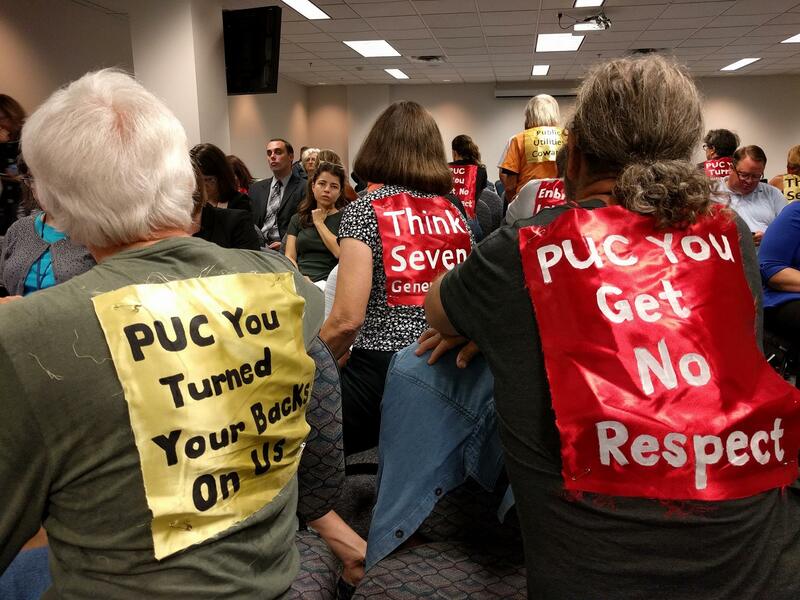 Water Protectors turned their backs to the PUC during Monday’s hearing, with messages pinned to their shirts. At the end of the day, the PUC should have listened to the tribes and taken their concerns more seriously. As someone who has sat through PUC process for more about two years, I have ideas about how the PUC could have done better. First, the PUC is not the right venue to litigate treaty rights. That’s a federal issue. Yet the PUC shouldn’t have ignored the issue. It could have taken concrete steps to honor Native nations and their legitimate concerns, delaying final Line 3 approval until treaty rights could be resolved in the appropriate court. The PUC should have hired an independent legal expert in Indian law to advise it. The Administrative Law Judge was not an Indian law expert, and her final recommendations in this area were flawed. The PUC should have taken the time to educate itself on these critical issues. Most importantly, the PUC could have made a commitment to resolve the treaty issues fairly. It could have added conditions to the final permit, delaying construction until treaty rights issues could be resolved in the appropriate court. The PUC’s final decision divided Anishinaabe bands. Some wanted the pipeline off their sovereign lands. Others wanted to stop a new pipeline corridor from affecting their off-reservation rights to hunt, fish and gather. The PUC order approving Line 3 has one other mention of treaty rights, part of a page-long section headlined: “Impacts to Indigenous Populations.” In a self-serving way, it uses treaty rights to justify building Line 3. The [Line 3] Project’s impacts to indigenous populations are of serious concern to the Commission. The Project route would traverse territory that was originally ceded by Minnesota’s Ojibwe and Chippewa tribes (collectively referred to as the Anishinaabe tribes or people) through treaties with the federal government, which determine the usufructuary rights the Tribes retain to hunt, fish, and gather wild rice and other resources in these lands in accordance with their traditional practices. But denial of the certificate of need would also have disproportionate adverse impacts on indigenous populations, because it would result in the continued operation of the Existing Line 3 through the Leech Lake and Fond du Lac Reservations, as well as multiple ceded territories. As explained above, continued operation of Existing Line 3 will require extensive and disruptive maintenance along the entire pipeline and presents a much higher risk of an accidental oil release. Leech Lake has made clear in its filings and at Commission meetings that continued operation of the Existing Line 3 through its Reservation is wholly unacceptable due to the risks posed to tribal members residing on the Reservation and tribal resources including wild rice waters. Comment: What the PUC fails to state is that it’s the federal government — not the PUC — that’s responsible for the current Line 3’s safe operation. If the PUC had serious concerns about the current Line 3’s safety, the appropriate action would be to press the federal government to take action. The Line 3 vote involved two kinds of treaty rights. The first is sovereign tribal land rights, second is the off-reservation treaty rights to hunt, fish and gather on lands ceded under treaties. The PUC decision gives the illusion that it is honoring treaty rights (sovereign lands) while quietly ignoring the hunting and fishing rights. It effectively pits Anishinaabe bands against each other. Rerouting Line 3 makes Leech Lake happy because it removes the hated pipeline from its lands. At the same time, the PUC’s decision opens up a brand new pipeline corridor, threatening lands where other bands have treaty rights to hunt, fish, and gather. The PUC’s actions divide native nations who otherwise had a common interest in opposing the pipeline. This is nothing new. Native nations have faced this divide-and-conquer approach for centuries. As noted above, the PUC order acknowledges the off-reservation rights exist — that there are “treaties with the federal government, which determine the usufructuary rights the Tribes retain to hunt, fish, and gather wild rice and other resources in these lands in accordance with their traditional practices” (page 29). But the PUC stops there. It pays lip service to these rights and subsequently ignores them. These rights are enforceable. Most recently, the U.S. Supreme Court case Minnesota v. Mille Lacs Band of Chippewa in 1999 established that the Mille Lacs band had treaty protected rights to hunt, fish and gather on the lands it ceded by treaty. 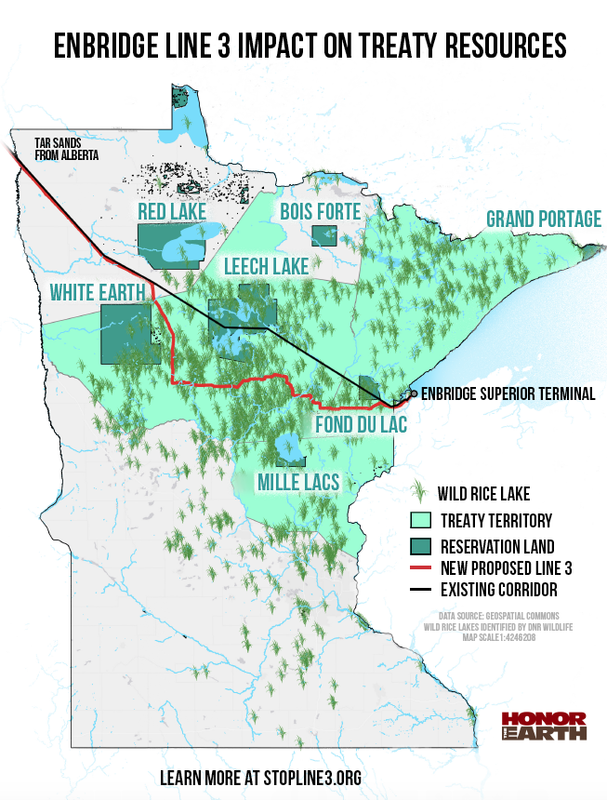 Various Anishinaabe bands reminded the PUC about Minnesota v. Mille Lacs Band and claimed that Line 3 would damage their hunting, fishing and wild rice gathering rights on the lands crossed by Line 3. The PUC order fails to address this argument. In the PUC Line 3 case, the all white commission apparently thought so highly of itself — and thought so little of indigenous people — that it believed it could dismiss treaty issues with no justification. It did not take the argument seriously. It made no effort to education itself about treaty law. It saw no need to delay Line 3’s final approval until the appropriate court could hear the case. It used its power to serve corporate interests rather than legitimate indigenous interests. I don’t know what was in the hearts of the PUC commissioners when they voted, but I don’t need to. It’s not so much about intention but impacts. The PUC’s failure to address these rights to hunt, fish and gather on ceded lands will do real damage to Anishinaabe peoples. It smacks of racism.